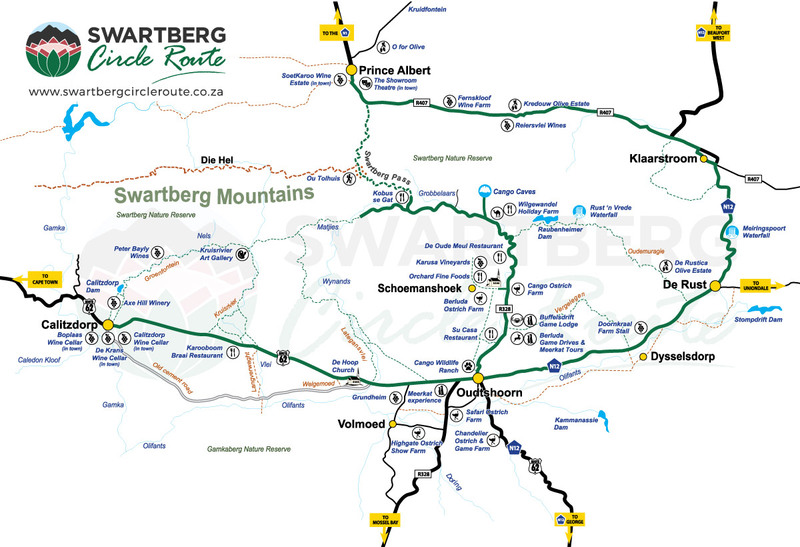 What does the Swartberg Circle Route entail? The Swartberg Circle Route is a scenic and interesting drive. Travel from Oudtshoorn or Calitzdorp to De Rust, Klaarstroom and Prince Albert, over Swartberg Pass and through Meiringspoort. The trip may be started at any of the four towns and traveled in either a clockwise or anti-clockwise direction. The picturesque back routes include Oudemuragie, Vergelegen, Lategansvlei, Groenfontein, Kruisrivier and Langverwaght. The Route offers you a taste of adventure, a wide range of culinary delights, a touch of culture and an overall feeling of well-being. Have you travelled the Route?